When size, weight, power, and maneuverability come into balance, you find yourself in a zone where time just disappears. Stay the course because there is no road the all-new V-Strom 1000 ABS was not made to conquer. This motorcycle makes the journey of life seamless. Conquer city traffic as easy as you scale mountains. Roar down new highways. Explore your taste for discovery on roads long untraveled. Starting now, the planet is your neighborhood. 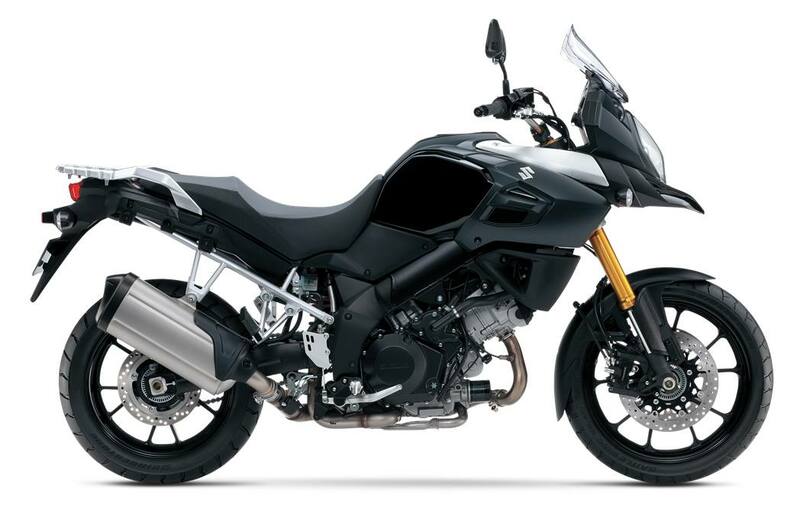 The 2015 V-Strom 1000 ABS was redesigned from the ground up last year and features an enormous amount of improvements from the previous generation. One of several leading features on the new V-Strom is its Traction Control System – the first on a Suzuki motorcycle. Other features that were improved or redesigned are the engine, fuel injectors, magneto, idle speed control, radiator, clutch, transmission, exhaust, suspension, and much more! See the features list for more details on this one of a kind adventure bike! *The ABS is a supplemental device for brake operation, not a device for shortening stopping distance. Always remember to reduce speed sufficiently before approaching curves. Suzuki’s traction control system continuously monitors the front and rear wheel speeds, the throttle position sensor, the crank position sensor, and the gear position sensor. It quickly reduces engine output when it detects wheel spin. It controls the engine output by managing the ignition timing and air delivery every 4 milliseconds. The rider can select three modes (1, 2, and off). Modes 1 and 2 differ in terms of sensitivity. Mode 1 has lower sensitivity; it allows a certain degree of rear wheel spin. Mode 2 has higher sensitivity; the system effects traction control sooner. The light and compact Anti-Lock brake system (ABS) system monitors the wheel speed as much as 50 times per wheel rotation and matches the stopping power to the available traction. A 1037cc, 90-degree V-twin engine is designed to get you where you want to go. Whether it is around town, on the open highway, or down the road less traveled. New, 10-hole fuel injectors (replacing four-hole injectors) on each throttle body improve fuel atomization for better combustion efficiency and lower fuel consumption. Redesigned main frame and subframe increases rigidity balance for greater stability and handling. It’s also 13% lighter than the previous model. Dial adjustable rear shock helps ensure a smooth and comfortable ride even with a passenger and a full compartment of luggage. Tokico 4-piston monoblock front brake calipers with 310mm floating-mount dual discs are now equipped with the new V-Strom for a stronger braking performance. Newly designed Enkei wheels are a lightweight 10-spoke cast aluminum. The 9-way adjustable windscreen has been designed through extensive wind-tunnel testing. A 12V DC outlet is located below the instrument panel is for ease of use and is ideal for powering a navigation unit or charging your mobile device. The seat is shaped for comfort and the sidewalls have a high-grip texture.